Another Friday already! And another Team Highlight! 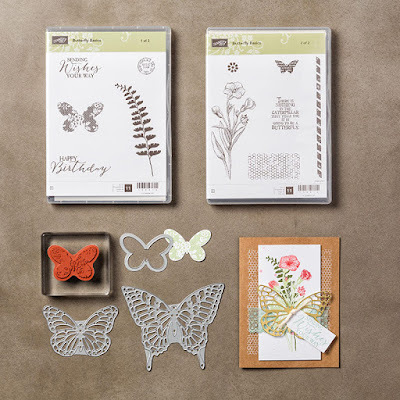 Can you guys tell I absolutely love my new Butterfly Basics Bundle yet? haha! 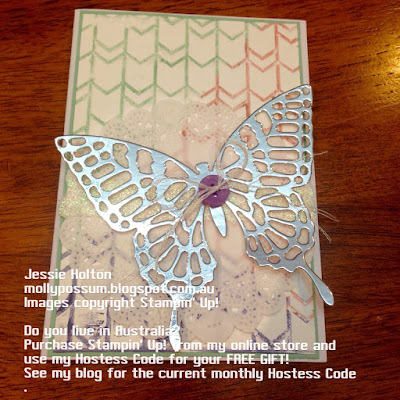 Please vote for my card here - this link will be open from 8pm AEST tonight! I've chosen my colours from the Pinterest Inspired Challenge. Check out Lexa's beautiful card we had to case (copy & selectively edit) below! I've taken the background pattern & used similar colours, although I think Lexa has used Lost Lagoon & Pink Pirouette, but I've gone for a mix of Mint Macaron, Blushing Bride & Pool Party. I have patted my ink pads directly onto the Arrow Embossing Folder & then put a piece of Whisper White cardstock in it & run it through the Big Shot. 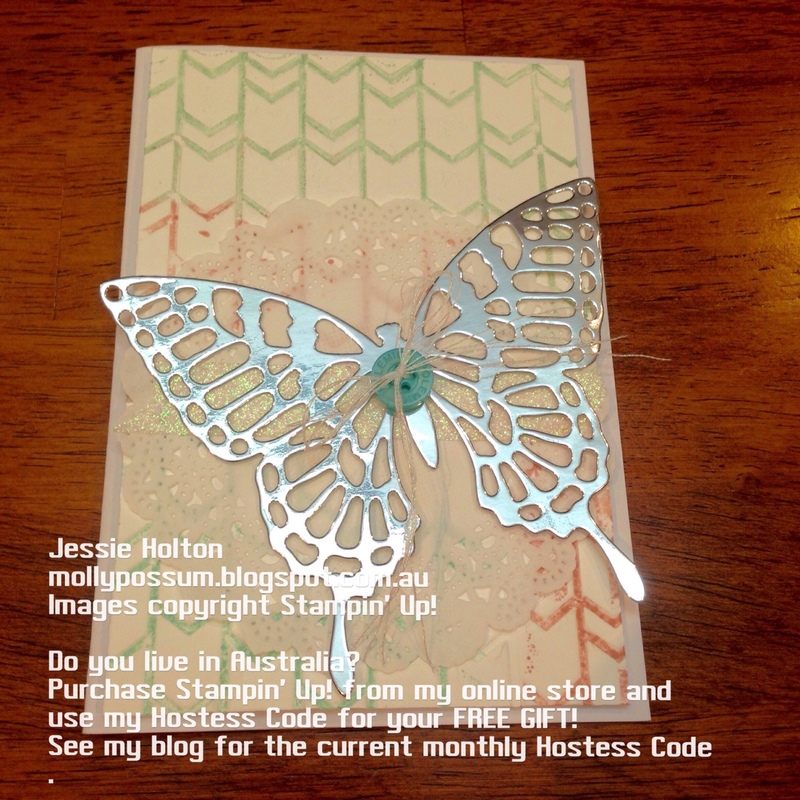 I have also used the Big Shot & Precision Plate to cut out the big butterfly from my new bundle in Silver Foil cardstock. 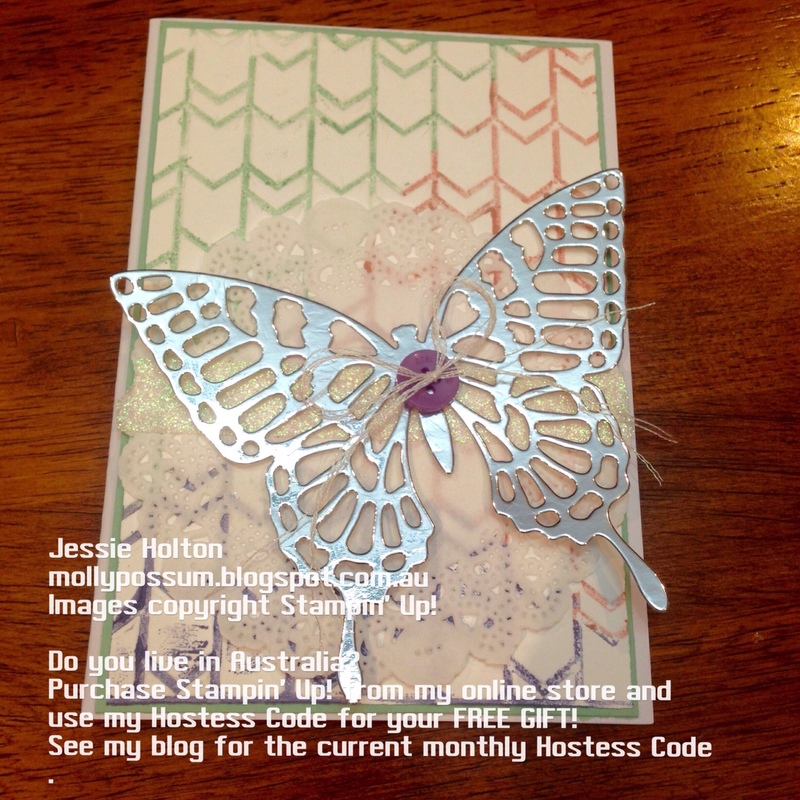 I've layered these with a strip of White Metallic Glitter Tape (Sale-A-Bration item - available for FREE but only until 31 March with a $90 AUD spend on any current product!) & a White Paper Lace Doily. 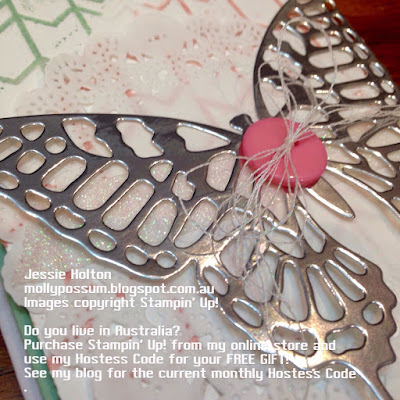 I've tied a pink button to the butterfly with white metallic thread (both from my stash) before adhering it onto the card with two Glue Dots under the body of the butterfly - I wanted the wings to be able to lift up a little from the card. I've also done a fine Mint Macaron border of cardstock underneath. Here's another version I made with Mint Macaron, Blushing Bride & Wisteria Wonder. And another version with the original colours, propped up on Dimensionals instead of the Mint Macaron border. How lovely! Thanks for taking part in the Crazy Crafters project highlight this week. Pretty cards. 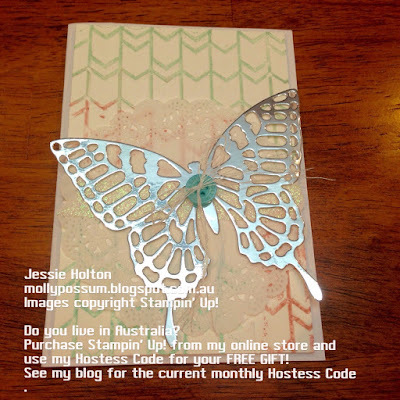 Love the backgrounds and the butterfly is gorgeous in silver. Gorgeous!! 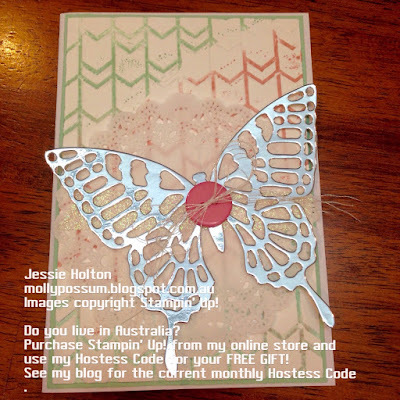 Really love the silver butterfly! Thanks for playing along with us at the Pinterest Inspired Challenge! !